This annual conference is dedicated to developing a community of scholars interested in conducting research into understanding family firms and creating usable knowledge in this field. 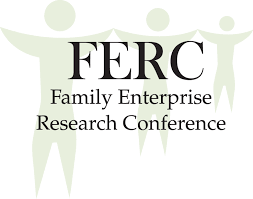 Established in 2005 by Mark Green and Pramodita Sharma, the goal of FERC is to enable scholars to design and develop research projects that are theoretically sound, empirically accurate, and of practical significance to family firms. We strive to ensure rigorous standards and a developmental culture. I have been to many conferences over the years, but FERC has it all: stimulating presentations, networking, ideas for research, beautiful venues--and good food. I encourage anyone who hasn't attended FERC to plan to attend in the future. Even someone like me who's been in the family business field for over 30 years finds FERC to be a wonderful learning experience. FERC is a great networking opportunity. As such, FERC helped me to build up relationships with international scholars that share my research interests - indeed, it was during FERC conferences that I got to know most of my co-authors. Besides, the feedback that I received for my presentations at doctoral consortiums as well as poster presentations tremendously helped me to improve the quality of my publications. Recent attendees share what makes FERC so special. Read more testimonials.